Welcome to the latest Leicester till I Die Interview written by David Cockroft. Alan played 104 times in City Blue from 1979 to 1982 scoring 26 goals during The Jock Wallace era, nut is also well remembered for his time between the sticks in THAT ¼ final FA Cup match against Shrewsbury Town. He is currently a summariser for BBC Radio Leicester. Former Leicester City striker Alan Young has never been one to mince his words. His punditry style on BBC Radio Leicester has been enjoyed by Leicester fans all over the World, from Beaumont Leys to Los Angeles and the Scotsman is relishing his new role. The man signed by Jock Wallace in 1979 is reigniting his relationship with the fans that watched him then forging new ones with the next generation of fans that listen to him now. 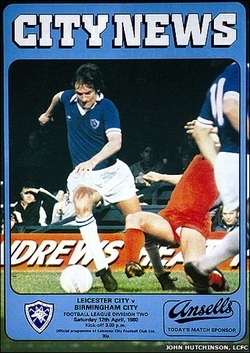 Young’s expert commentary is based on his experiences as a hard working centre forward, a fashion of striker that isn’t seen often enough these days, especially at Leicester City. Nigerian striker Yakubu was the usual choice to lead City’s frontline last term and his work rate raised issues with many fans, one of them being the big feller in the press box. Young’s concerns over the Nigerian’s fitness stem from the player’s attitude toward it. Young may have finished his rant on a light-hearted joke but the point he makes is one that was clearly evident in the strikers work rate, or lack of it, last season. The Scot wouldn’t mind a pre season session with Yakubu either to help amend his flaws. It’s an area of the game that Young knows all too well is imperative to a professional footballer. The no nonsense, tough tackling striker is sadly a rare breed in English football these days but on 104.9fm on a Saturday afternoon you’ll find one screaming down your headphones. Young himself claims he’s very optimistic about City’s chances of promotion next season and the fans will be hoping he has a lot more to shout about in his coming commentary sessions.